Electric motor fitted as standard, bevel gear available on request (price reduction). On single units 651 – 700 cm, units with 3 hinged arms and linked units always electric motor. Fabric cover shell The optional fabric cover shell offers an elegant solution for concealing the fabric roller. Arm bracket Reliable and secure, the arm bracket is made from high-strength aluminium alloy. Its round design matches the contour of the fabric cover shell. Upper arm fork of forged aluminium. An additional gear unit permits progressive adjustment of the awning pitch from 5º to 52º, ensuring that the awning is always at the right angle in relation to the sun. Optionally available for widths up to 600 cm and 350 cm front profile. Optional Vario valance available for Family and Family Basic models with a height of 150 or 200 cm. 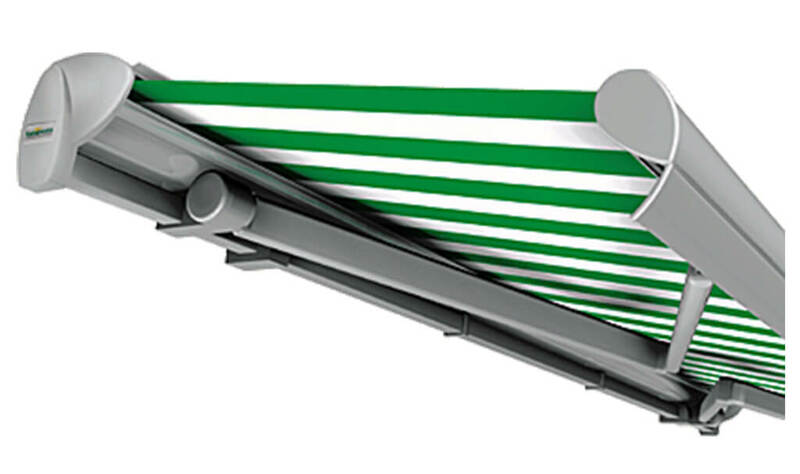 The Vario valance will fit units up to 600 x 350 cm in size.